It’s that time of the year again where I pick my top seven prospects of 2015. This isn’t easy but its fun to figure out. There is a lot of talent to sift through. After a long drawn out research on our minor league system, I now present to you all my top seven. 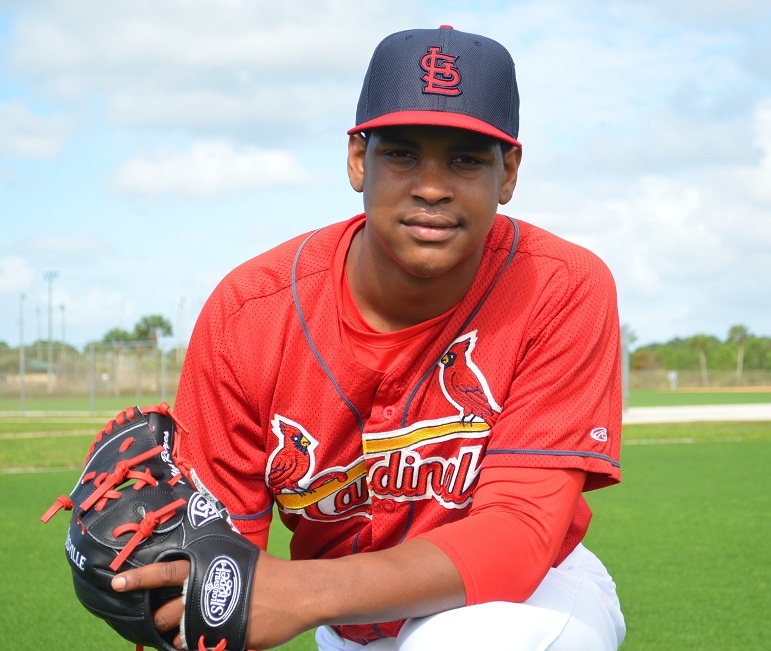 Alex Reyes RHP-Reyes since has emerged as the preeminent power arm in the Cardinals system. He has two legitimate swing-and-miss pitches in a 93-95 mph fastball that can reach triple digits and an upper-70s curveball that combines power and depth. He has an easy delivery that bodes well for his long-term health.Still somewhat raw on the mound, Reyes has yet to show much consistency with his changeup, control and command. He has a sturdy frame that carries more than his listed 185 pounds, and he’ll have to watch his conditioning. Marco Gonzales LHP- Gonzales’ pitches play up because of his ability to locate with precision and to add and subtract velocity. He throws an 88-91 mph fastball with decent life and a mid-70s curveball with some depth. His ceiling may be limited to No. 3 starter, but he has a good chance of reaching it. Jack Flaherty RHP- Flaherty repeats his delivery with ease, allowing him to throw strikes and maintain his stuff deep into games. He could have been a sweet-swinging third baseman with gap power and quality defense, but the Cardinals like his chances of developing into a No. 2 or 3 starter. Edmundo Sosa ss-Sosa has an advanced gameplan at the plate for a teenager, focusing on making contact and drilling line drives to all fields. Once he learns to use his plus speed, he’ll be a basestealing threat. Power won’t be a big part of his game, though he has some strength and will sting the ball into the gaps on occasion.Sosa’s defensive tools aren’t spectacular, but he gets the job done at shortstop and should be able to stick there. He’s an instinctive defender with good hands and enough arm to make the throws required at the position. Nick Plummer OF-Signed for $2,124,400, Plummer has above-average hitting ability and power potential. He has a quick left-handed swing and a mature approach, stroking balls from gap to gap while showing advanced pitch recognition and plate discipline. He’s an average runner with some savvy on the bases.There’s a split camp on whether Plummer can stay in center field, because he lacks the typical speed for the position but overcomes that with good instincts. If he has to move, he’ll probably wind up in left field because of his lackluster arm. Magneuris Sierrra OF-He won the Gulf Coast League batting title with a .386 average and also led the Rookie-level circuit in on-base percentage (.434), runs (42), hits (78) and total bases (102).Sierra uses his strong forearms to whip the bat through the strike zone. His swing is flat and geared more toward line drives at this point, but he should produce at least gap power and could be a home run threat if he adds some strength and loft down the road. He uses the entire field and has better plate discipline and pitch recognition than most players his age. Luke Weaver RHP- Weaver has hit 97 mph in the past, Weaver usually works at 91-93 with his fastball. He commands it well and imparts good sink on it, but his best pitch is clearly his changeup, which is deceptive and features even more life. He has yet to show much aptitude for spinning a breaking ball, and there’s some thought that he might be better off trading in his slider for a cutter.